Bradley with forwards coach Neil Back. LESS THAN A year after guiding them to the Heineken Cup semi-final, Edinburgh Rugby have today announced that head coach Michael Bradley will leave the club at the end of the season. The Scottish side are currently languishing ninth in the RaboDirect Pro12 table, just two points ahead of Bradley’s former club Connacht. Such a disappointing display has no doubt contributed to the Scottish club’s decision not to renew the Corkman’s contract. Particularly as it backs up a season in which their European run was in stark contrast to their league form, where they only finished above the now defunct Aironi. Edinburgh will now begin the search to replace both Bradley and his defence coach Billy McGinn – who has resigned with immediate effect – at the same time the Scottish union is searching for a coach to lead the national team after Andy Robinson’s resignation after the November internationals. Bradley, who acted as interim head coach for Ireland in between the tenures of Eddie O’Sullivan and Declan Kidney, will now oversee the defensive duties alongside forwards coach Neil Back until the end of the season when his two-year contract comes to an end. Email “Pro12: Bradley set for Edinburgh exit”. 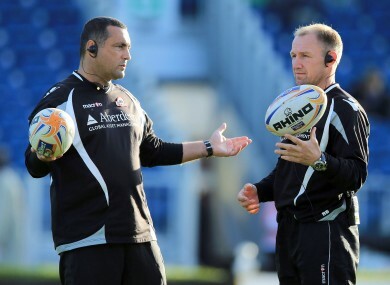 Feedback on “Pro12: Bradley set for Edinburgh exit”.